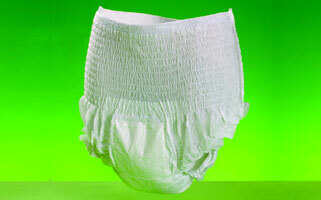 Lille Suprem Incontinence Pants offer an ideal solution for managing moderate to heavy incontinence. Designed to allow people to maintain their independence and live life to the full. Worn just like regular underwear they are easy to use and offer comfort and discretion. Available in two absorbency levels – Extra + for moderate use, or Maxi for heavy use. More Discrete: Anatomic shape for a better fit and more comfort, whilst remaining discreet. Leg Cuffs: For maximum anti leakage security. Closure tape: To assist with hygienic disposal. Wetness indicator: Turns blue in contact with urine to estimate remaining life of product.